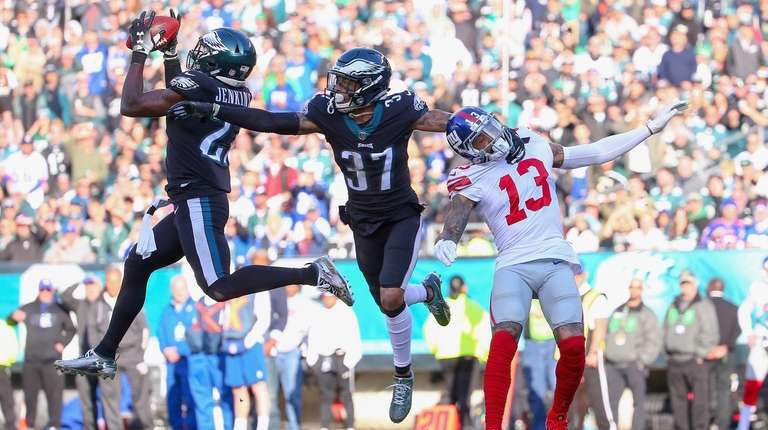 Beckham Jr., Shepard would have preferred to see more passes against the Eagles' injury-depleted secondary. PHILADELPHIA — Odell Beckham Jr. didn’t explicitly question the play-calling of coach Pat Shurmur in Sunday’s 25-22 loss to the Eagles. But the star wide receiver suggested that he would have done things differently against a defense dealing with several injuries in the secondary. Beckham made it a point during his postgame interview that he wouldn’t directly address how Shurmur called the game. Wide receiver Sterling Shepard also appeared frustrated after the Giants lost the momentum they had built in the first half. They took a 19-3 lead in the second quarter, and Eli Manning completed 19 of 25 passes for 236 yards and a touchdown before throwing an interception in the final seconds with the Giants up 19-11. But he threw only 11 times in the second half, completing six for just 61 yards. Saquon Barkley had 94 rushing yards and a touchdown in the first half, and the rookie scored the Giants’ other touchdown on a 13-yard pass on their first drive. Barkley provided the Giants’ biggest offensive play on a 51-yard touchdown run with 4:06 left in the second quarter. He found a hole through the middle before cutting to his left and reaching the end zone to give the Giants the 19-3 lead. Barkley was limited to 7 yards on four carries in the second half, but he refused to question the play-calling.